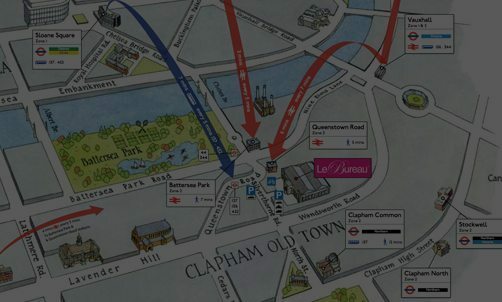 Nearest tube is Clapham Common (Northern Line), walking distance or short bus journey, bus 137. Click here to view Tube Map. Battersea Park Rail Station, one stop from Victoria. Queenstown Road Rail Station, two stops from Waterloo. 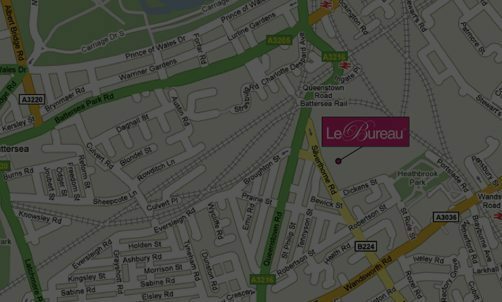 Both stations are one stop from Clapham Junction and are a 3-5 mins walk. Click here to view London Connections rail map. Overground. Wandsworth Road Overground, 5-10 mins walk. Local buses 137, 156 and 452 almost to our door. 44 and 344 to rail stations. Click here to see Battersea Park area bus map. Visitor and trade parking available in the Battersea Studios car park. We are super cycle friendly. Secure parking – CCTV and security. And showers! We are outside the Congestion Charge Zone. Click here to view the Congestion Charge Zone map.